"When I dip, you dip, we dip..."
Oh, not that kind of dipping. Though I'm sure they wouldn't object too much if you started dancing out of joy at Yojie Japanese Fondue. 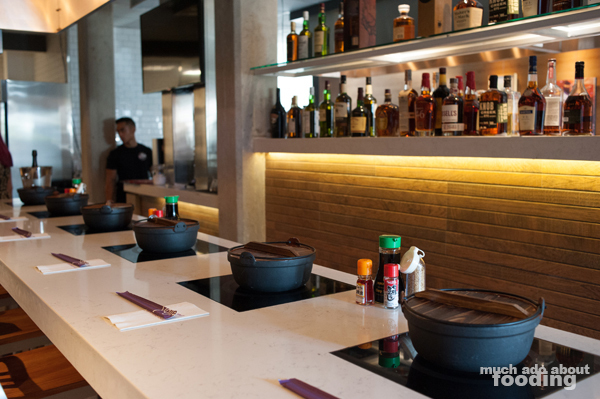 Downtown Santa Ana has just welcomed a new kid on the block in the form of Japanese cuisine and hip design. 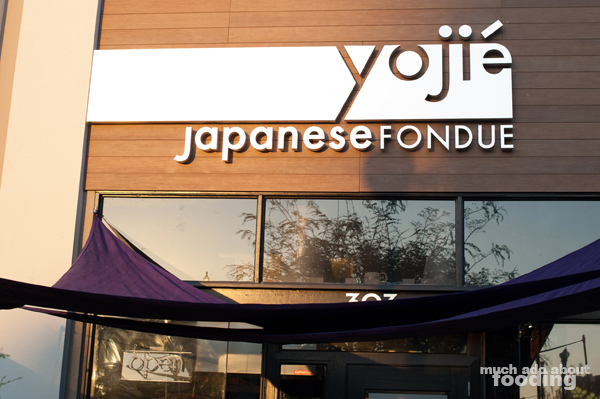 Yojie Japanese Fondue is a franchised restaurant that allows for local flair to shine through, and the location in Santa Ana has taken advantage of this with their layout and inclusion of local artists' work. If you're wondering what Japanese fondue is, the group refers to their shabu shabu and sukiyaki that way - the interactive dining experience of "cooking" your food yourself in a hot pot set on an inlaid burner. 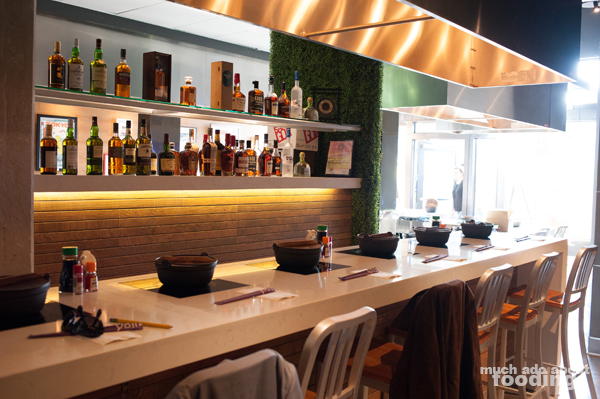 Located right next door to the infamous Yost Theater, Yojie can be a fun pre-show dining experience or even after-show as it is open late in the evenings. Think fresh, quality ingredients and fun interaction while at dinner. They also have quite an array of sake to choose from and cocktail menu (not available when we visited). The seating wraps around the whole restaurant from front to back in bar-style with sleek, natural overtones likely to accentuate their ingredient choices. 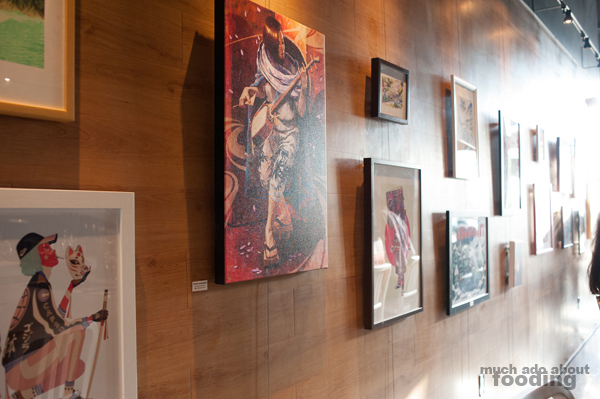 If you're interested in art, you'll be happy to know that local artists' work line the walls and eventually purchasable features will be showcased. We were invited to preview the restaurant just moments before the grand opening. 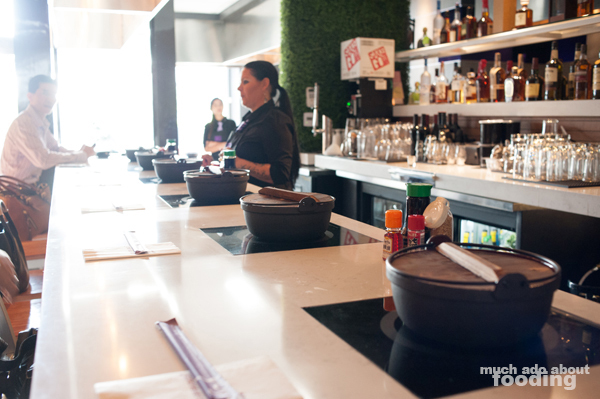 When it comes to options at Yojie, one choice is to go "swish swish" (shabu shabu) by cooking your protein and vegetable selections in boiling water before dipping those in the savory sauces they present. This seemed the more health-conscious route as it is simple but still flavorful depending on how you wish to dip each bite after it's cooked. 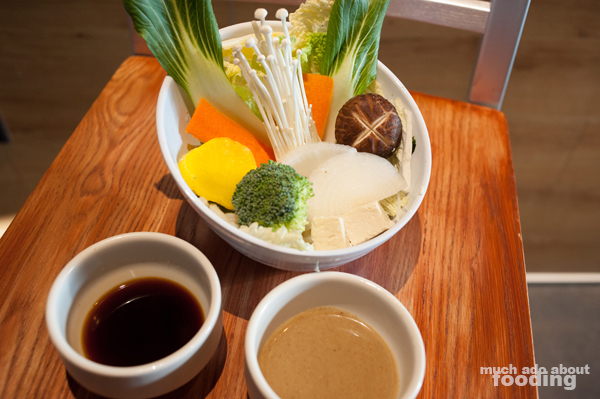 The other option is sukiyaki which lets you cook your proteins and vegetables in a premixed "broth" made of a combination of soy sauce, sugar, and mirin. This style also presents diners with a fresh egg for additional dipping. Duc went this way as it is the sweeter of the two options. 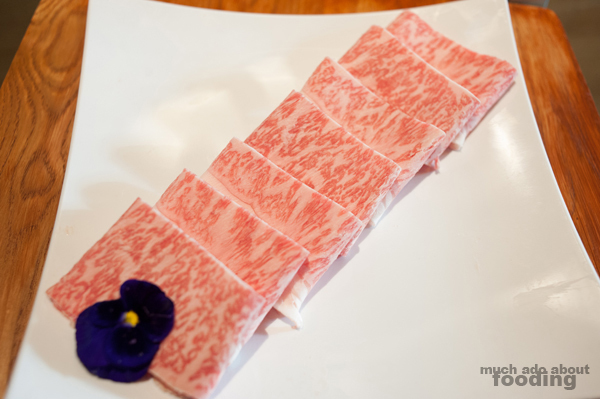 The wagyu beef slices we both got with our meals were so marbled, we almost didn't want to cook them at all. However, they did perfectly release their fattiness into the broth and add a great mouthfeel to the vegetables already brewing in the pots. I also appreciate the generous amount of vegetables with each meal! 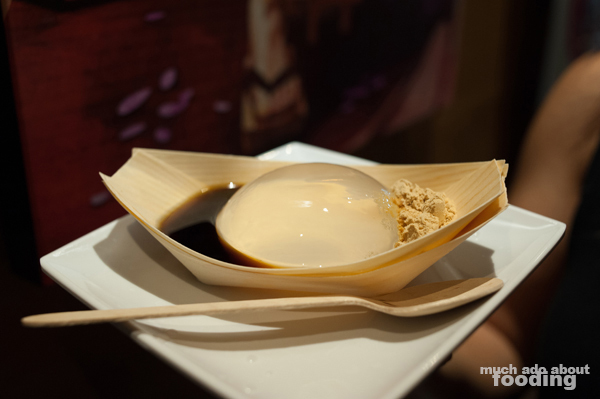 The experience ended with raindrop cakes, a recent fad among dessert-seekers these days. Personally, we would have been just dandy ended with our tender wagyu beef and more of that sesame-based dipping sauce! Find Yojie at 303 N Spurgeon St, Santa Ana, CA 92701. Photography by Duc Duong. More available on Facebook here.